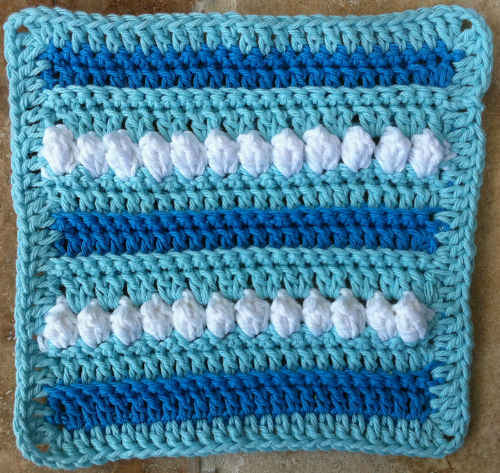 Carol Ann Marks wrote: As the northeast was snowed under, I was searching the internet for crochet projects and came upon your “Heart” dishcloth. I love “Theme” projects and started on heart dishcloths for family and friends. I read the Dishcloth Challenge and as I worked I started to create. My Snow Lady dishcloth is the result of my love of snowmen, and the snowy January we are experiencing. I chose the purple hat and scarf because this past October my crochet guild “Pine Needlers Chapter of CGOA” supported “Project Purple” for Providence House, our local domestic violence shelter. We were able to provide 40 purple scarves for the staff to wear as they provide services for their clients. The pink hat and scarf then came from our continued support of Breast Cancer Awareness. Of course, I am now thinking Kitchen colors, school and team colors and bright cheery children colors. In the past, our guild has provided standard crocheted dishcloths in personal care packets for a local Interfaith Homeless Group program and our domestic violence shelter. I thought perhaps a cheery Snow Lady washcloth might be a nice touch. Of course my imagination keeps going and I can see them as pot holders, towel holders and decorative hot pads on the table. In the past I have submitted patterns to Leisure Arts and my Snowman Afghan was published in “Contest Favorites 40 Afghans to Crochet”. Leisure Arts also published “Snowman Ridge” in “40 favorite Ripple Afghans”. I also designed “Welcome Friends” as a donation to Ronald McDonald House and that pattern was published by Crochet Fantasy in Winter 2002 afghan favorites. What fun your challenge has provide and I would love to submit my pattern for your consideration. 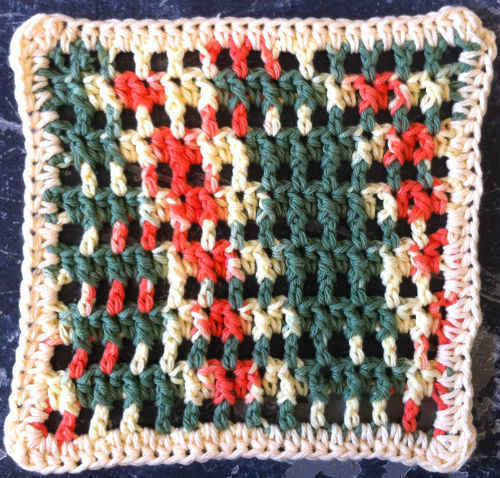 Thank you for joining the Dishcloth Challenge Carol Ann…Follow me onto dishcloth #37 and the rest of the story. 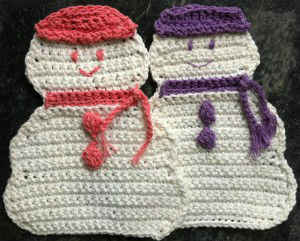 The Snow Lady dishcloth is now available in the Winter Dishcloths Crochet Pattern Set.